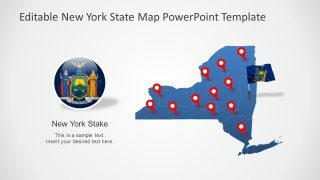 The Portland Oregon PowerPoint Map is a vector template to present the beautiful city of USA. 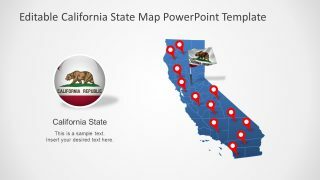 This PowerPoint template displays the amazing geographical map of Portland city and overview of Oregon state. The Oregon is one of USA’s 52 states in pacific northwest. 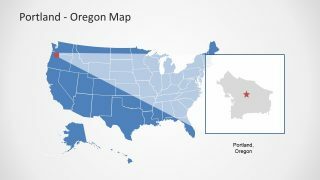 The map template also shows the overview of United states with location marker to highlight Oregon. Similarly, the Oregon state map highlights the Portland with location marker clip art icon. The Portland has the vast history of natives and American pioneers. Because of Willamette river which runs through the center of the city, it is also known as the Bridge tow. This template shows the outstanding silhouette of cityscape and view of its impressive bridges. 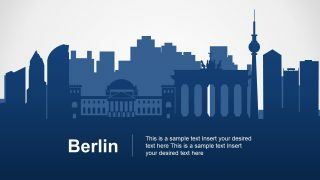 The SlideModel has another stunning template of Frankfurt am Main PowerPoint design in maps. 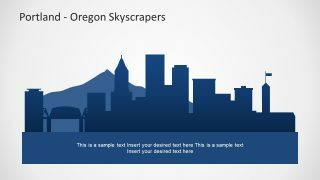 The Portland Oregon PowerPoint Map is an 8 slides template of brilliant geographical maps and incredible landscape silhouette. For instance, the first slide shows a skyline view of skyscrapers and bridges with mountains behind. 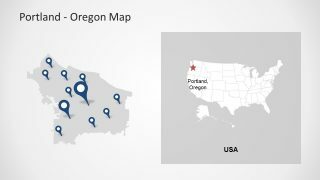 This is ideal presentation slide to use as main header while demonstrating the Portland Oregon demographics. For example, the trades, culture, statistics of color or ethnicity, tourism, business and opportunities. 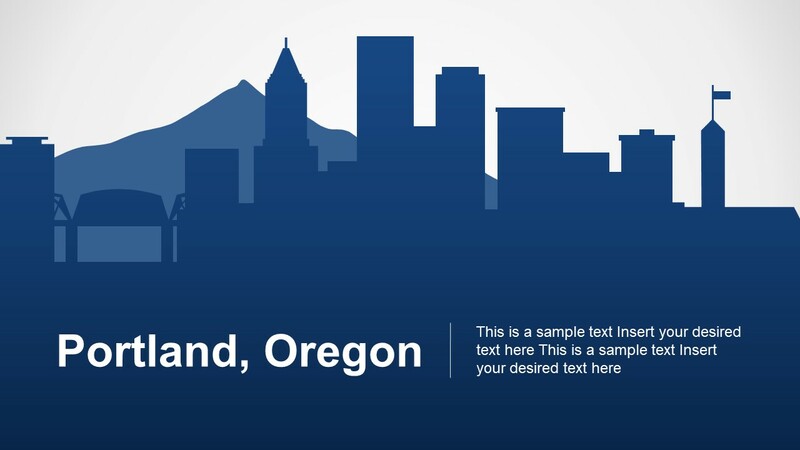 The vector graphics of Portland Oregon are easily editable and scalable PowerPoint shapes. 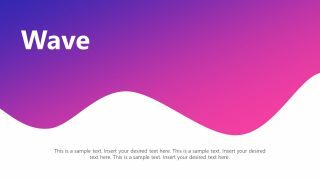 This feature enables users to alter the colors. Also, put multiple colors to the districts to quickly identify them. 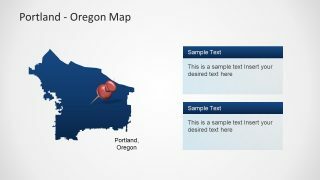 This remarkable template of Portland Oregon map contains several PowerPoint design slides. All the vector graphics are high resolution images; therefore, rescaling does not affect the quality. 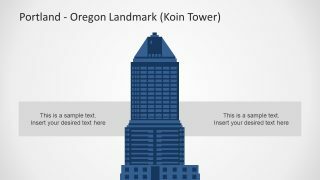 Moreover, the PowerPoint template has silhouette image of landmark Koin Tower with placeholders and gray background. 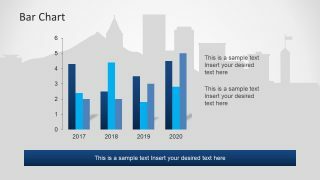 The Portland Oregon PowerPoint map contains a bar graph slide with cityscape view as background to present statistical data. 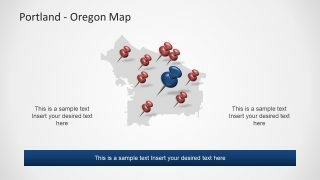 The template provides 4 slides of Portland and Oregon state maps with clipart icons. Such as, geographical location markers and pics, and star icon to point the Oregon state.